How to create a Landlord Reference Letter? Download this real estate Landlord Reference Letter template now! The real estate industry requires often you deal fast. You simply do not have the time to spend on picking up real estate contracts from your customers or tenants, nor do you and your time have time to be stuck in the office drafting different contracts each time. You will find that each real estate agreement is proofread by real estate and legal professionals and can be customized to include photos and any other details if needed. Adequate communication is essential to real estate companies to ensure truthful, accurate information exchange and enables to do morally-correct decision making. Real Estate companies need to give consideration to how they communicate and remain lawful in their day-to-day business activities. Therefore, communication in situations that involve legal complications, request extra attention. Using our easy-to-modify (e.g. visuals, typography, etc) Landlord Reference Letter can make a huge difference and a great fit for your needs. The 3 step process virtually guarantees you can finish and print your legal document much faster than when you start from scratch! If you're running a real estate business, you will require such documents. Feel free to download our basic or advanced document templates, they are intuitive and in several kinds of formats. Our trustworthy real estate templates are all crafted and screened by professionals in the industry that have experience in special law-related fields and are actively involved in legal issues around the topic. 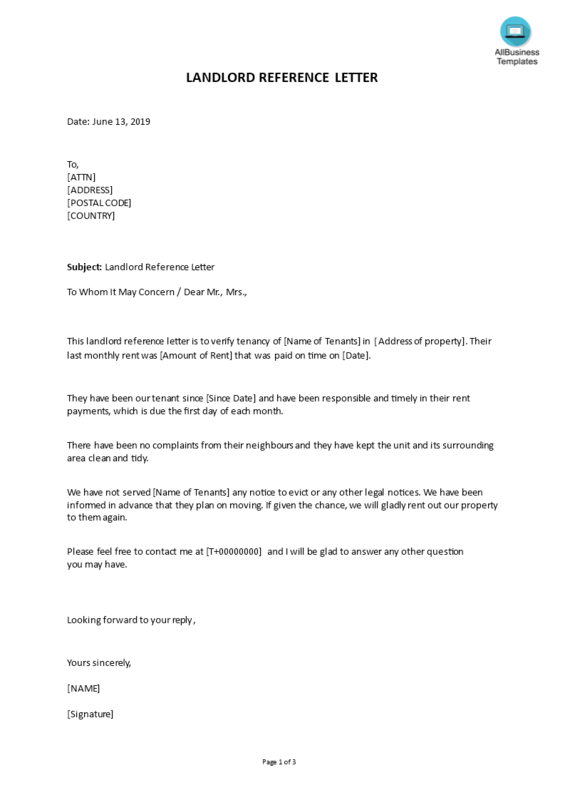 This Landlord Reference Letter template covers the most important subjects and will help you to structure and communicate in a professional way with those involved. Find any real estate business or legal form you need, and let your word processor help you write it quickly. Download this professional real estate Landlord Reference Letter template if you find yourself in this situation and save yourself time, efforts and possibly reduce the lawyer-fees! Using our real estate and business document templates will help you to deal with every applicable situation! These document templates will help you dealing with legal matters as well. However, we still recommend considering local legal support in case you have any doubts. Property Manager Company Logo Date: Landlord Reference Letter This landlord reference letter is to verify tenancy of Name of Tenants in Address of property Their last monthly rent was Amount of Rent that was paid on time on Date..
Also interested in other Real Estate Form templates? Just search on our website and have instant access to thousands of free and premium real estate agreements, contract, documents, forms, letters, etc., which are used by professional realtors, developers, estate agents and brokers in the real estate industry. For example Real estate forms, Power of attorney, Letter of intent, Property Purchase contract, Agreement for permission to sublet, rental application forms or loan agreements, and much more. All business templates are easy to find, crafted by real estate professionals, ready to use, easy to customize and intuitive. Pay close attention to the available real estate template by searching and browsing through the list. Take the time to review and choose the variety of real estate document templates that meet your needs.